National Plant Services worked in Montecito, California, from Jan. 17 to Feb. 23, cleaning and inspecting the community's entire collections system following the Jan. 9 mudslide. National Plant Services recently wrapped up its time in Montecito, California, following the devastating mudslide that hit the community in early January. Although it will take much more time for the area to completely recover, progress has been made since National Plant Services initially arrived on scene Jan. 17 to help with cleanup efforts. That day, National Plant Services crews arrived in Montecito to complete darkness. Not just the dark of nighttime, but a desolate blackness that comes with a complete lack of civilization. The only illumination came from police and emergency crews, digging through the wreckage of what used to be a community. Four crews from National Plant Services were involved in the cleanup efforts. They were tasked with completing a condition assessment for essentially the entire collections system; no small task when even finding manholes was a challenge. City workers accompanied the crews to locate access points, along with excavation trucks that had to scrape away at caked mud to expose manholes. “Even getting to the city was a challenge,” Garcia says. National Plant Services crews were working around the clock at first: 12- to 15-hour day and night shifts with the four crews rotating two at a time, some days inspecting up to 12,000 feet of pipe. National Plant Services took a water truck in addition to its Vac-Con and camera trucks because water was cut off to much of the town early on. “There were only certain fire hydrants that were working, so we made sure we weren’t chasing water all day,” Garcia says. 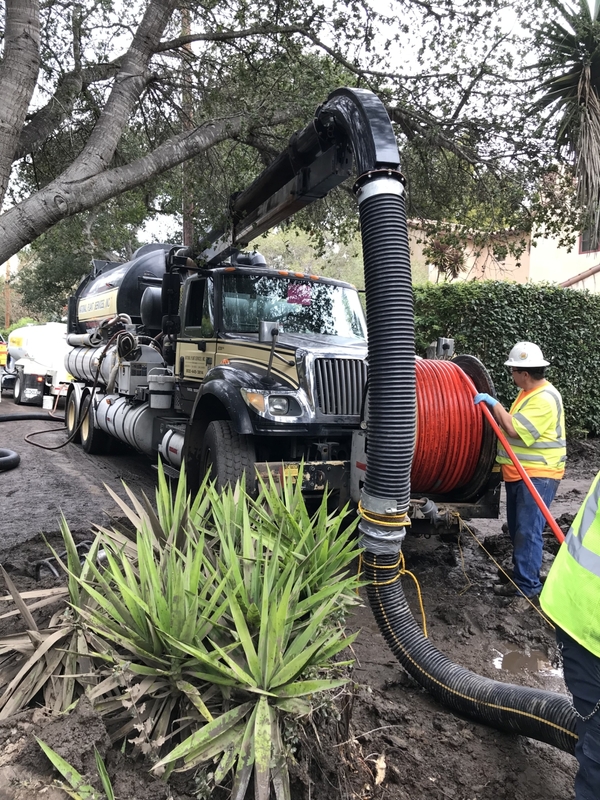 Overall, National Plant Services spent a little over a month in Montecito and inspected around 100,000 feet of pipe, even inspecting some sections of the system twice. “Some of the stuff they just wanted to burn through to make sure it was OK, and then they had us come back,” Garcia says. National Plant Services also engaged in some rehabilitation efforts, including capping laterals to houses that had been swept away or red-flagged as unsalvageable, as well as replacing some manholes that had been destroyed or completely blocked with debris.